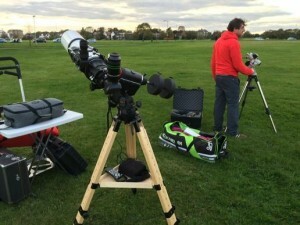 Well, you’ve got to love astronomy in the UK… don’t you? !… don’t you?!?!?!? A very frustrating couple of hours on Blackheath on Saturday evening. Nick and I had been discussing the weather for most of the day (in the absence of anything productive to do) and decided at 3pm that we would go ahead with the event. The forecast was for sunny spells and cloud… we just hoped that the clear skies would be in the right place at the right time! We were all set up by 4.30pm and started on our quest to find the Moon. Not easy, when the Sun is still up and there’s quite a bit of cloud about. The skies overhead and to the east were pretty much cloud free, but there was a stubborn band of cloud to the south-west, in exactly the direction where we were expecting to see the Moon. 5.05pm (the start of the occultation) came and went. So we missed the start of occultation. Right on cue, the clouds started to part. Nick and I quickly fitted solar filters to our telescopes and we trained the scopes on the Sun to take a look at the giant sunspot currently on display. And what a sight it was. Absolutely huge. I had some solar glasses with me, and the sunspot was clearly visible with the naked eye. A fantastic sight. Lots of people from the nearby funfair on Blackheath came over to see us, and were rewarded with this spectacular view of the Sun. As the Sun started to dip below the horizon, we resumed our quest for the Moon. Finally, one of the attendees who had a pair of binoculars spotted the Moon and we quickly moved the telescopes to this area of the sky. The Moon was barely illuminated (only 3% or so), so looked like a tiny slither of light in the eyepiece. Still, it was a lovely sight. However… you guessed it… the clouds started to roll in again. This time, we knew we were done for. A huge bank of slow moving cloud covered the Moon at about 5.50pm. Saturn was due to reappear from behind the Moon at 6.07pm. Oh dear. Frustratingly, the sky to the east and south-east was completely clear! A few hardy souls stuck it out until 6.08pm, but it was more in hope than expectation. Ah well, the joys and frustrations of astronomy in the UK! At least we managed to see the spectacular sunspot group, but the occultation of Saturn behind the Moon evaded us. This is the last in this series of Moon-Saturn occultations. I haven’t bothered to look up when the next one is… I suspect it’s a long way off. Ah well… let’s hope the next observing event has some clear skies. One nice little phenomenon we saw when packing up.. the “belt of Venus” to the east… a lovely pink glow on the eastern horizon, caused by the Earth’s shadow.